What is with you bald guys who don’t like losing your own hair and yet you razz other people, celebrities, about their hair loss? Since you don’t like it that you have lost your own hair why do you tease others who have lost their hair? 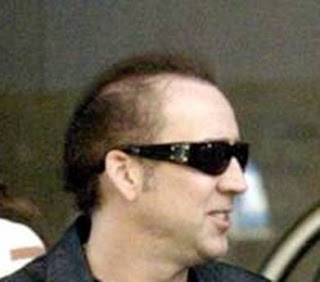 are we teasing Nic cage? » are we teasing Nic cage? I would give up my caribbean island, my apollo landing module my Bugatti Veyron Super Sport costlier, my yearly pass to a small brothel in Fiji and my last tot of whiskey for a full head of hair and nick and me feel the same way. With all the financial incentive in the world to cure this disease, scientists are STILL dragging their feet. Almost no money is put into hair loss research. I swear the first person to come up with the cure deserves the Nobel Prize in medicine. » » lost their hair?